Move the lever down (to SET-), and hold it. Your vehicle set speed will decrease by 10 km/h (5 mph). Release the lever at the speed you want. Move the lever down (to SET-), and release it immediately. 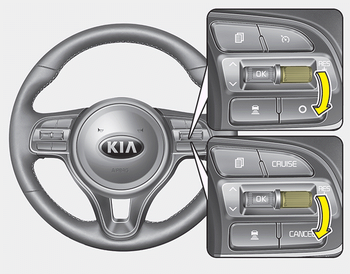 The cruising speed will decrease by 1.0 km/h (1.0 mph) each time you move the lever down (to SET-) in this manner. You can set the speed to 30 km/h (20 mph).